The city of St. Louis has experienced a decline in the number of residents since hitting it’s peak population back around 1950. The most recent disappointment came in the 2010 census results showing, in spite of optimism on the part of the city for better numbers, the population of the city of St Louis had declined by nearly another 1o percent during the decade, falling from 348,189 people in 2000 to 319,294 in 2010. During that same decade there were efforts to revitalize the city and bring new life to it as developers built new and fun living spaces by converting warehouses and other “non-residential” buildings to loft condos and apartments, rehabbing historic homes as well as through the construction of new homes in existing neighborhoods. Through the strong lobbying efforts of REALTORS, Builders and other groups promoting redevelopment of the city, there were enormous amounts of money thrown at much of this development in the city by way of tax credits and other incentives along the way. Unfortunately, the old adage “build it and they will come” did not prove to be true in the case of the city because, as the census data showed, the city continued to lose residents at a serious rate. The crash of the real estate market certainly didn’t help and in fact stalled the momentum that had begun. So what’s the result of all of this? Well, the latest data estimates from the U.S. Census Bureau shows that almost one in five housing units (19 percent) in the city of St. Louis was vacant in 2011. As you can see from the table below, this is twice as high as the next highest county in the area. Vacant buildings are problematic to a community in many ways: They many times fall into a state of disrepair or suffer from a serious amount of deferred maintenance, they invite crime and bring down surrounding property values. For the city itself they can become a financial burden if the owner does not maintain the property forcing the city to come in and maintain it or correct issues that pose a threat to the public. Unfortunatley, unless the city can do something to change the trend of the population shift, it will probably be many years before the excess inventory of housing stock in the city of St Louis has depleted. 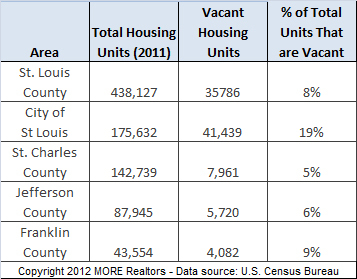 City of St Louis Has Second Highest Vacant Property Rate In The U.S.